We know that the one who has died in Christ has been set free from the old master, sin (Rom. 6:7). Nonetheless, we battle against the flesh, and our new master calls us to put to death the sin that lurks deep within us. Perfectionism is not an option, for no portion of Scripture teaches that we can become sinless before our glorification. Neither is carnal Christianity an option. Jesus and His apostles everywhere assume that the grace of God does not leave people where it finds them; rather, the Spirit works in us, and we along with Him, to mortify our sin and sanctify our lives. 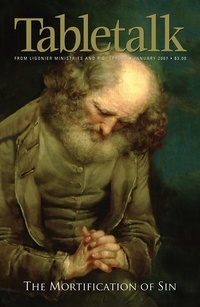 This January 2007 issue of Tabletalk aims to encourage our readers to take up the charge to put to death those base, sinful desires of the heart (Col. 3:5). Contributors include R.C. Sproul along with Sinclair B. Ferguson, Kris Lundgaard, Joseph A. Pipa Jr., R.C. Sproul Jr., Gene Edward Veith, and Eric B. Watkins. Tabletalk features articles about topics central to the Christian faith and daily, in-depth Bible studies. Since Genesis has such a prominent place in history, the 2007 Bible studies continue from 2006 with Part 2 of this book.